We hear Mary’s voice a scant four times in the New Testament, but her quiet witness to the ministry of her son resounds throughout the gospels. The Gospel of Luke includes three instances of Mary speaking, while her words are heard once in the Gospel of John. Luke’s references occur early in his gospel: we hear Mary respond to Gabriel’s announcement that she is to give birth to Jesus; she next speaks during her visit to her cousin Elizabeth; finally, Luke describes her worried chiding of the child Jesus in the temple. Each occurrence illuminates the depth of Mary’s faith, and her love of God and his only begotten Son. Mary’s words in the Gospel of John add a vital component to these instances, explaining how we, as people of faith with our own abiding love of God, are to respond. Mary is seated next to Jesus at the wedding feast of Cana when Jesus is told that the hosts have run out of wine. Mary is brief but direct in her instruction to the servants: “Do whatever he tells you,” a directive of value not only to the serving staff but to us as well. While Mary speaks but a handful of words in the gospels — and, in fact, is mentioned only slightly more than a dozen times in total — she is an invaluable model of faith for us. From the moment she identifies herself to Gabriel as a servant of the Lord and then gives birth to Jesus in Bethlehem, through to her presence at Christ’s first miracle at Cana, waiting at the foot of the cross and then experiencing the Resurrection, Mary is the ultimate example of fidelity, never wavering in her love for her son. Her deep, strong conviction carries her through her life, taking her from the depths of sorrow to heights of immeasurable joy. Today, as we celebrate the Feast of the Assumption, let us turn to Mary for inspiration and guidance on how we too can serve as witnesses to the world that, as Mary learned when she was just a young girl, nothing is impossible with God. Subscribe now to Living with Christ and participate more fully in the Eucharist! 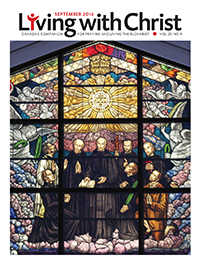 Visit our website or call 1-800-387-7164 to begin your subscription to Canada’s companion to praying and living the Eucharist.